The Obama Loyalist continues his Twitter war with the increasing number of anti-Obama Progressives. He tries to diver their attention by trashing Republicans. If you think the NSA’s bad, just let the GOP impose its regressive social agenda on the US and the NSA will look like child’s play. Poor Charles, he is trying every trick in the book to keep the Left in line and continue unconditional support of Obama. He is trying to get Progressives to stop attacking Obama because it might (It will not) help Republicans. Charles is not interested in the truth or our Constitutional Rights. 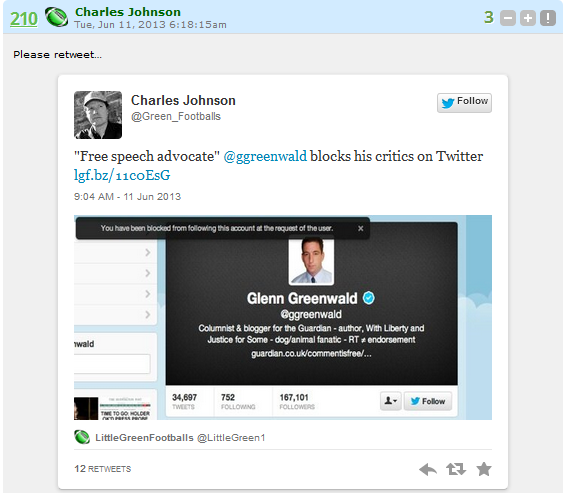 Charles Johnson’s minion Bubblehead II joins in on the act and j’accuses Glenn Greenwald of being racist. Charles and his minions are desperate and are flinging anything to see if it sticks. They are Obama Loyalists to the end and will do anything to prop up their god-king. Many on the left have come to see Charles as just a Obama Loyalist. He twists and changes positions to defend his beloved god-king against Progressive criticism. 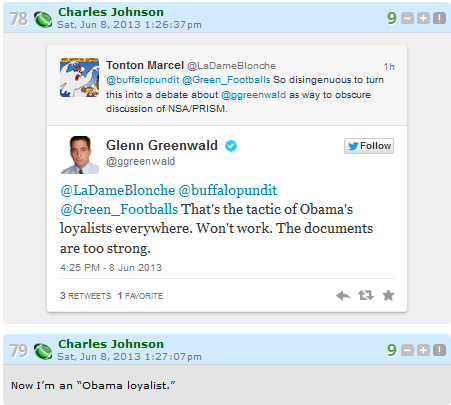 To prove his loyalty to the Leftist cause, Charles now defends Glenn Grenwald. Peter King is calling for arresting Grenwald, this gave the Obama Loyalist an opening to try appeasing his Progressive critics. 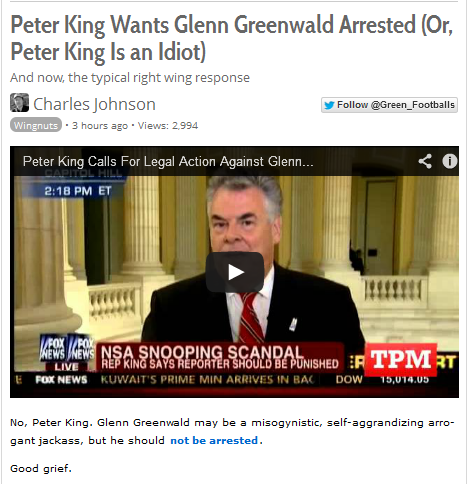 No matter how much Charles tries to defend Grenwald from Peter King’s imprisonment calls, the Left still will not accept him. Its funny when someone blocks Charles on Twitter he goes into an uproar. This coming from a man who had his critics reported as spam and had them blocked on Twitter. The Obama Loyalist is upset that Glenn Grenwald has blocked him on Twitter. Charles got a taste of his own medicine and does not like it. The Obama Loyalist is doing all he can to keep his minions in line on the PRISM scandal, some of whom have turned on Obama over privacy issues. 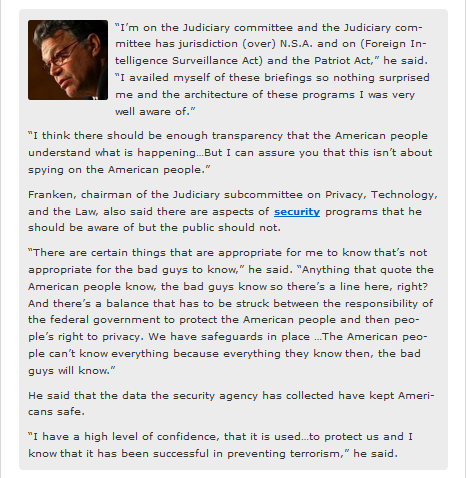 In order to keep people in line, Charles uses AL Franken’s assurance that teh data-mining is good. The Obama loyalist is just doing his job. Charles is always trying to pick fights for attention. His latest obsession is Progressive Glenn Grenwald who is an opponent of Obama’s from the left.Today Charles got his wish, Glenn Grenwald responded to him on Twitter. He gave Charles a verbal beat down. 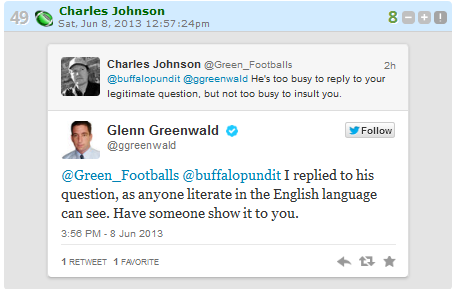 Glenn Grenwald called out Charles for being the lying hack he is. I don’t politically agree with Grenwald, but I enjoy his smack down of the Obama Loyalist.